I had to figure a way to combine my moto addiction with my penchant for amateur radio and spend some quality time under a tree, on a mountain in the middle of nowhere, reaching out to see what I could find on the airwaves. I thought, what could be more fun and interesting than a camping trip to a nearby peak with like-minded pals? How about a moto camping trip with a cook, gourmet food and a high-powered, compact amateur radio transceiver to reach out to the world from the middle of nowhere? 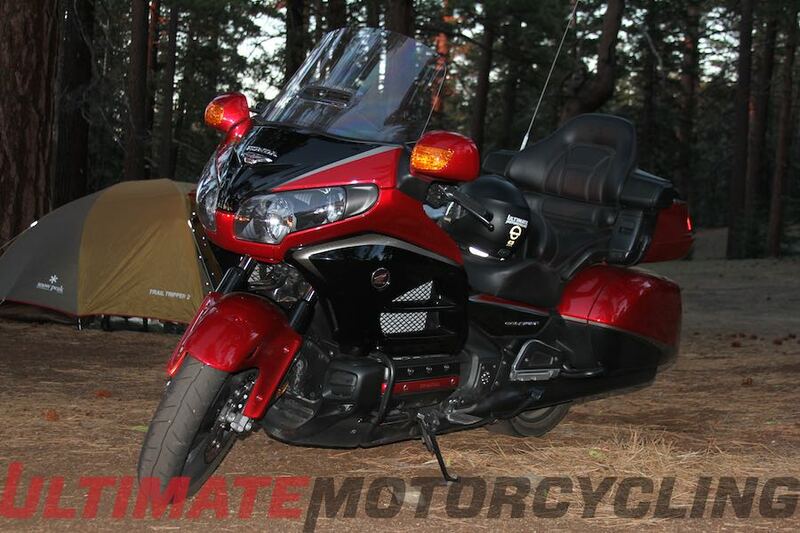 Take one nerdy motorcyclist, then load about 40 pounds of high-tech ham radio gear onto a 2015 Honda 40th Anniversary Gold Wing. Then, head to the top of Cerro Noroeste, the highest mountain in Ventura County, Calif., for a couple of days of camping and chasing distant (DX) contacts on the high frequency ham bands. Having a two-way radio is a unique incentive to camp atop mountains as the higher one places his antenna the better the results. Although the ham radio desire may not resonate for some, it is an interesting, productive and amusing hobby. A ham radio rig, a license to operate one, and knowing how to use it can be a comforting part of a preppers kit when planning for SHTF (stuff hits the fan), too. I can’t explain the lure of talking with others via ham radio, especially one hauled into the woods on a motorcycle. To send out a signal and get a reply from another ham in the next county or the other side of the globe can be a thrill. I reckon you either get bit by that bug, or not, but there are over 775,000 licensed radio amateurs in the US and that’s more than ever before. For me, the idea that I can operate my radio off the grid and chat with other operators is exciting. There is even time to hike and do other activities. I haven’t camped in many years but the plan has been brewing in the back of my mind for some time. When I decided to make this trip I wanted to do it right and was fortunate to know Cameron Marshall, Mr. Moto Camping, or Camdog to his friends. Marshall is the owner and leader of Moto Mentor, a unique outfit that offers training, mentoring and tips on better camping for owners of fully loaded adventure bikes. Cameron works with many of the local motorcycle dealerships, and their customers, with training sessions and first-class getaways almost every weekend. I highly recommend taking a weekend with him and his clientele repeat often. I told Cam that all I needed was a table and a mountain peak. He suggested we go to Campo Alto, a small, clean and sparsely used campground in the high pines about 10 miles from Pine Mountain. Three details made this ideal. The 8,300 foot altitude was perfect for my antenna, the road was paved all the way up and the campsite was at the very top of the mountain, which is important as it allowed me to enter the Summits on the Air (SOTA) contest. More about this later. I had a good amount of gear to pack so the Goldwing was the perfect choice and thus necessitated paved roads all the way. I was escorted by six BMW GS riders with full loads on knobbies. When we stopped at the Reyes Creek Bar and Grill, at Camp Scheideck in Lockwood Valley, another biker came up, saw the group and asked if I slowed everybody down. One of the guys answered, “He keeps up.” That was praise enough coming from this experienced group. If you’re out this way Reyes Creek has just about the best burger in SoCal. Open every day except Christmas. Cash only. The Wing turned out to be the perfect choice. All the radio gear and some food fit in the top case, the rest of my stuff in the panniers with the antenna, tent and sleeping bag bungeed to the back seat. I was loaded but no more than if I had a passenger. The Wing didn’t even notice the weight and it was strong and sure every inch of the way, in the lap of luxury. Sun and warmth blessed our trip and was welcome since this area experienced sub-freezing temperatures only a couple of weeks earlier. Daytime temps in the 70s gave way to low-60s overnight. We enjoyed the 140 mile route from Ventura to Ojai, continuing north up 33, a world-class strip of tarmac. Throughout the ride I spent time thinking about how I was going to bring all my plans to fruition. I’d never done this before and the ink on my General-class radio license hadn’t been dry for very long. I wasn’t worried about the camping part of the equation. Cam, Jayson, John, Charles, Rob, Nicholas, Justin and Beagle were all pros and left me to set up my own gear. It was around three in the afternoon and I knew I had over five hours of daylight remaining. I pitched my little tent and threw my sleeping bad and gear inside then heard the distinctive sound of beer bottles opening and was invited to grab one but that would have to wait. During the planning stages for the trip I found out about SOTA. This UK-based organization has cataloged most of the world’s mountains, given them designations and assigned points for making contacts from them or to those summits. The rules are fairly simple. Activators, as those who take a ham radio to the summit are called, must be within 25 vertical meters of the actual summit, operate on batteries, make four or more contacts and may not use generators or operate from a vehicle. Chasers, those who look for and contact Activators, are given points for the contact. So I had to make four QSOs (ham talk for contacts) to officially activate Cerro Noroeste and be the 16th ham to do so. The game is afoot. After squaring away my personal equipment I finally got to set my sights on the radio. Once I was powered up and tested I checked the 20 and 40 meter single sideband frequencies and spent some time listening and hearing what was going on. All of a sudden that brew was calling my name and there is nothing quite like a cold one on the campground bench. I’m going to detail the radio operation and experience a bit further down the page as I don’t want to put my non-ham readers to sleep yet, if I haven’t done that already. Concurrent with my setup was a fire built in the ring. Man, the smell of that mixed with the crisp mountain air was invigorating. Cam and the boys were burning down a good layer of coals. Jayson was making campground (or caveman) margaritas and they were surprisingly good. Next thing I knew a tray of roasted sweet peppers, stuffed with melted cheese and wrapped with a slice of bacon was being passed around. Not just one or two but enough to make everyone eventually hold up a hand in refusal. My challenge was trying to keep the radio controls from getting greasy. This was only the start. Next came lollipop lamb chops, medium rare with a little char and Nicholas made an excellent Greek salad. Then came carne asada and chorizo tacos with all the fixin’s and homemade chili verde salsa. By the time the chicken was on the grill I was stuffed and happy. Throughout all the courses was spirited banter and laughter. This group was, I think, comprised of all comedians. And throughout this I was spinning dials. Honestly, not many of the guys were interested in the radio but a couple of them did approach and ask about the how’s and why’s and what’s of it all, especially when they heard me speaking to other operators far away. Nighttime fell and we did have some lighting. The hit was my tiny inflatable LED lantern which finally earned me some respect from this well-equipped crowd. As it got later I packed my electronics back in the Honda’s topcase to protect it from moisture and critters. On the flip side, sleeping in a bag on a thin self-inflating mattress must be an acquired taste or skill. I’ll have to work on that because I had a rotten night’s sleep. This was my only complaint during the entire trip and it really wasn’t so bad. The return trip home was uneventful and I will do this again, in a heartbeat. Next time I’ll do SOTA again, spend a lot more time at it and bring a better mattress. Now the fun begins. First the MFJ Enterprises MFJ-2289 Big Ears portable dipole was deployed. I knew I could use a simple long wire to a tree branch as an antenna but decided on this gem as it was no problem to carry and it allowed me to rotate the array for directional selectivity. It is matched to an optional MFJ-1918EX tripod with a 10 foot mast and it all folds down to a 42-inch long package that, when strapped crosswise to the seat of the Wing, was only a few inches wider than the bike. The Big Ears has two telescoping stainless steel elements that reach 17 feet (each) in length. They screw into an aluminum block that holds them in a V pattern. This is quite impressive and the distance between the large pine trees was enough to allow me to rotate the antenna in any direction. I connected a 50 foot RG-8x cable to the MFJ-925 automatic antenna tuner. The truth is I probably don’t need the tuner as the antenna is easily tunable from 6 to 40 meters by moving a coil shunt and/or adjusting element length. I had it so I brought it and bouncing between 20 and 40 meters was a no-brainer with SWR easily under 1.5:1. This, my non-ham readers, means the antenna was very efficient at passing my transceiver’s power out through the airwaves and not having a portion of it reflected back to the detriment of my signal. The quality of all of MFJ’s components is excellent, especially given the prices. Probably my biggest worry when organizing this trip was how I would energize the radio. At full power the radio consumes 20Ah but that is during transmission. When listening on standby it’s more like 1.3Ah. I knew that even at full power I would not be broadcasting continuously but I did want to conserve. I also wanted the immediate satisfaction of making contacts right away so 50 to 100 watts output would be more helpful than in QRP (5 to 10 watts) mode but drain the battery faster. Sure, QRP is more of a challenge and the battery would last longer but I had an ace up my sleeve in the way of Aspect Solar’s EnergyBar 300 and their EP-60 portable solar panels. Together they are called the Solar Power Pack Pro 60-300 and a more high-tech way to store, use and replenish power from the sun probably doesn’t exist. I could have used offerings from a few other companies but none of the specs compared. I could have used SLA or gel or other batteries and tried to figure out how to replenish them, not to mention carrying their greater weight. With the Aspect system I not only got the power I needed but it was integrated into one homogeneous unit and its size and weight made it easy to transport, even on the bike. It’s no wonder that this Aspect Solar unit has been used repeatedly in the Himalayas by the Marolt Brothers and their continued refinement of their equipment hasn’t changed their choice for the Aspect products. I also must report on the build quality and accessories, which are second to none. Fit and finish are superb and included in the Pro kit are the EnergyBar 300 and the water-resistant solar panels as well as an 8 amp wall charger. The whole kit is housed in a waterproof, hard plastic case with custom cut foam inserts. Since I couldn’t fit this on the bike I put the 300 into the included tailored canvas tote. The EP-60 self-packages in three folds then clips together. Its power lead stores in a side pocket. I may not have been able to include the case on this trip but it is fabulous for home storage and when I take it in my truck. The EnergyBar 300 stores more than 24 Ah (294 Wh) of energy in a 12-pound unit. It offers 120v and 220v AC, four USB ports and 12v (cigarette socket and Anderson PowerPole) through its Lithium Iron Phosphate (LiFePO4) batteries and built-in inverter. These are more advance than lithium ion batteries and are rated at 10-year life and 1,000 power cycles. It can be charged from the wall socket or through the EP-60 60-watt panels. I received this unit months before the trip and charged it up with the 8A wall charger. The week before the trip, much to my pleasure, I figured I would re-charge the battery only to find it had lost none of its charge in the months it was in storage, unlike all other rechargeables I own. I didn’t get to discharge the unit completely but Aspect claims that it will operate until shutoff, keeping the voltage steady until then. This is important to my radios and most other voltage-sensitive devices as there will be no voltage dip. Performance of this unit was all I could have asked. During the hours of listening and many minutes of full-power transmission I never ran the battery down to under 4 of 5 bars on the panel display and the transceiver, which will automatically switch to lower power if it’s not getting enough current, never did. The display also showed that the solar panel was charging even in partial shade and when the sun was dipping low in the sky. Leaving the best for last, I stack Icom’s IC-7200 HF/50MHz transceiver on top of the EnergyBar 300 and place the antenna tuner on top of the Icom. The tuner input connects to the IC-7200’s output and the tuner has a separate control cable just for this radio and makes operation automatic. Thanks to Aspect’s inclusion of an Anderson PowerPole 12v (20A) output port, the most popular way hams connect 12v power, I plug the radio into its power source with no need for any adapters. Win! Icom needs no introduction to hams and their IC-7200 is a marvel of technological advancement. The 7200, to me, is gorgeous and all-business looking. The feel of the controls is excellent. The tuning knob and other rotary controls have smooth and precise feel and the soft-touch buttons are just right. Build quality is second to none and running it at its full 100-watt power was no problem for the EnergyBar 300. It tunes most frequencies from, below AM radio into the VHF spectrum, including the major ham bands from 6 to 160 meters. Its compact size and an incredible array of digital filters allow this radio to dig weak signals out of a noisy background and it packs a heavyweight punch. It’s fairly easy to use but does require a bit of practice and understanding. Some experienced hams call it the best priced and featured introductory level transceiver on the market. I agree with the price and rich features but even a well-seasoned ham will like this radio which offers features often found only in more expensive units. At 12 pounds and the size of a three-inch thick piece of paper it did not take up much of my precious limited space. During the late afternoon I switched on an Icom IC-51A Plus handie-talkie to see if I could make some local contacts on 2-meters with 5 watts power. I could have made contact with a few local repeaters, such as the one in Frazier Park, but repeater operation doesn’t count in SOTA activities. I tried the national calling frequency on 146.52 MHz and was not really surprised to find no one around, even using a portable J-pole antenna to increase my range. Oh well. Read more on the IC-51A Plus in my Moto Go-Bag review. Operating the 7200 was a joy, especially since there was little background RF noise at the campground. Considering that at my home I can experience a noise floor of S5-7, operation with no noise seemed miraculous. I’m working at home to reduce my RF problems but this trip has really ignited a love for portable work and I’m already planning another trip soon. During my short time operating I logged 11 QSOs. Several were located in Southern California but more than half were much farther away including Nebraska, Ohio, North Carolina and Pennsylvania. For a time I aimed my dipole east/west to look for Canada and Central America but I found little there on 20 and 40 meters. My CQ Sota calls went unanswered. As I expected, when I rotated the antenna 90 degrees the bands lit up with light traffic from the east. It was kind of quiet for a Saturday and campfire stories and shenanigans got the best of me. Next time I’ll go with my radio pals and spend more time on the air. With the IC-7200 and MFJ antenna I had an easily portable rig that received reports of strong signals and easy readability almost exclusively. My buddies were blown away when I told them I had just spoken to Dave in the Philadelphia area and they heard me chatting with him as though he was nearby. Those interested in getting started might want to check with the Amateur Radio Relay League, founded in 1914. They have information on licensing and groups in your local area that offer classes, help and testing. Another website to check is HamStudy.com.